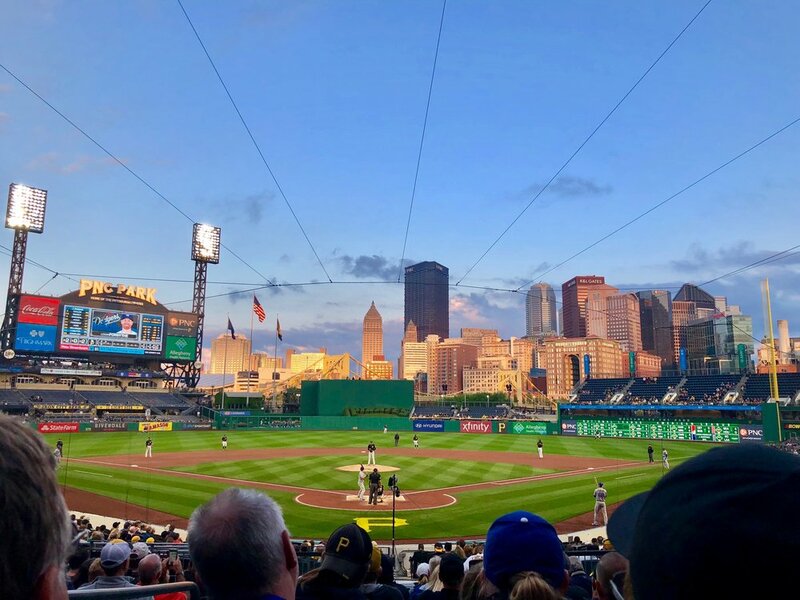 Pittsburgh is not only one of our top destinations to send road trip travelers but also our hometown! As native Pittsburghers, we know all the best places to explore, eat + enjoy the rich culture the city has to offer. Pittsburgh is broken up into many diverse neighborhoods, 90 to be exact, each providing a new + exciting view of the history of the city. Each one feels as if you are in a completely different places! Today we are sharing some of our favorite neighborhoods include The Strip District, Lawrenceville, North Shore, and Mount Washington, Station Square. A center of festivals + events, especially during the summer, is the bustling downtown center. Home to the cultural district, where you can catch a music or live show at one of the many historic theaters, the David Lawrence Convention center + Point State Park, the beautiful fountain, trail, and bike path at the convergence of the City’s famed three rivers. Täkō - Super fun + funky taqueria with creative Mexican food, an extensive margarita list, and a modern atmosphere whose focus on farm to street food mission is transparent across the cool space. Bae Bae’s Kitchen - A casual dining spot + great place to grab lunch that focuses on Organic, Healthy, Korean Inspired Cuisine. Offering "build your own rice, noodle, or salad bowls, the combinations can be enjoyed in the charming indoor space or taken to go! Meat + Potatoes - One of the first major players in the downtown culinary revival, this chic gastropub is named for the comfort foods that they expertly dish out. Highly recommended for brunch! A home to our sports centers + abstract museum right over the bridge from the main point of the city. Depending on the season, many baseball games, football games, concerts, and festivals crowd the area bringing all the entertainment you can think of along our famous river opposite side of the fountain! The area is easy to walk to or you can take the T train. Mattress Factory - Filled with contemporary exhibits that take up entire rooms this is not your typical art museum. Randyland - also known as Pittsburgh’s Most Colorful Landmark, this museum is actually home to the artist who created it, Randy Gilson. Admission is free! Andy Warhol Museum - The world’s largest collection of artwork + archival materials of this Pittsburgh native. Stop by to learn the life, art + legacy of the pop art legend. Located just outside the city center is a street dedicated to local sports, food, art, and businesses spread throughout many blocks. Especially on the weekends, people will be decked out in black and yellow representing their favorite team no matter what the sport. Weave your way down the street to shop at many pop up markets selling anything from candles to art to even adopting a puppy! That’s right, a full puppy pen lies in one of the lots that are ready to find happy homes. Make sure to hit the Strip District early as businesses tend to start to close between 3-5 pm. That gives you plenty of time to check out another spot for the night! Bar Marco - Recently named one of Pittsburgh’s best all-around restaurants by Pittsburgh magazine, this minimalist, Italian inspired wine bar is perfect for a date, impressing your parents, or just feeling fancy at brunch on the weekend. Primanti Brother's - The original location of the famous Pittsburgh sandwich - open since 1933! The sandwich is compiled of meat, fries, tomatoes + cole slaw all between two slices of fresh Italian bread. Stop by for a classic taste of Pittsburgh! Smallman Galley- chef-incubator for new and local dining concepts, currently with four unique food options and two bars, and a cafe. Plenty of choices if you’re feeling indecisive! Gaucho - Fantastic Argentinian food that includes wood-fire grilled meat that melts in your mouth + hearty salads. They are BYOB as well, so you can sip your favorite beverage while you enjoy! A throwback to a more hipster time is located on Butler Street where you can find more interesting and aesthetically pleasing cafes, shops, restaurants, and bars. Many of the places have great daytime + nighttime vibes that’ll make you never want to leave! The Abbey on Butler Street: Once a funeral home turned bar, cafe, and restaurant! The local vibe creates a great atmosphere and the outdoor seating area even has a fountain. Vandal - Convivial lunch spot served European counter style! An interesting twist to any dinner experience. Cure - Also a finalist of the best restaurant in Pittsburgh is Justin Serevino’s urban - Mediterranean hot spot which focuses on quality meats highlighted on a small, local + seasonal rotating menu. NatuRoll Creamery - Pick your favorite fruity or chocolatey toppings and watch as it is rolled and crafted into ice cream right in front of you! B52 - A vegan cafe located just next to the corner of Butler + 52nd streets (hence the name). The cafe features a menu of American + Middle Eastern cuisine, house baked goods, chocolates, and a full service espresso bar - all made from scratch! Take the Duquesne Incline up to the greatest view of the city! The view is breathtaking at sunset into the night when all the city is fully lit. There are many spots along the mountain to catch the view from different points besides the most touristy on top of the incline. Take a walk along the cliff to see all the spots + interesting houses along the way! Altius - If you are looking for a fancy night out with a fantastic view of the city, look no further. Serving contemporary American food + chic cocktails this is one of the premiere Pittsburgh fine dining experiences. The Summit - Cozy pick offering hand-crafted cocktails + upscale pub grub and entrees stylish digs with exposed-brick walls. The aim is to reward you for making it all the way to the top by delivering an elevated experience inside a casual atmosphere. The centrally located neighborhood, named the best neighborhood for Millenials in Pittsburgh, is a popular residential neighborhood for many of the neighboring universities is home to historic mansions, numerous shopping districts, various public + private schools. Whether a night out on the town or a nice afternoon stroll is planned for your weekend, you’ll find options for both in this beautiful neighborhood. Casbah - A Mediterranean staple of the East End that intertwines classic dishes with constantly rotating newer dishes. Front-of-house service is professional, warm and inviting, the wine list is deep and the cocktail program is, quietly, one of the best executed in Pittsburgh. Dinette - A focus on freshness + sustainability is clear in this modern pizza shop. The restaurant decor is clean and minimalist, while the ingredients are local - sometimes as local as the rooftop garden. The seasonal menu + unique combinations will delight passionate pizza lovers! Millie Ice Cream - Located across from Casbah, this local shop homemade every flavor adding personal twists of flavor to each pint. You are sure to find flavors you’ve never heard here like Lemon-Lavender + Rhubarb Sorbet! Frick Park - A huge park to take a stroll through the woods, have a picnic in the lawn, or take the kids to the famous Blue Slide Park! Pittsburgh Zoo and Aquarium - Animal lovers of all kinds would love this Zoo and Aquarium duo located near Frick Park. The Zoo even includes a park + zip line experience. Schenley Park - Located right next to the University of Pittsburgh + Carnegie Mellon University is the expansive 456-acre park with hiking trails, tennis courts, a pond + more to explore for hours! You can’t run out of things to do if you take a trip to Pittsburgh or maybe we’ll send you there ourselves! All our trips are just as action packed as these suggestions, sign up today!